Black, 1" - The surface is textured laminate, with a nice and even bounce (the usual test of at least 23cm bounce back when the ball is dropped from 30cm height). The finish is matte and has very little reflection from light. 2-peice, with each folding up independently. Each half has a set of four sturdy 4" steel casters with very smooth rolling. 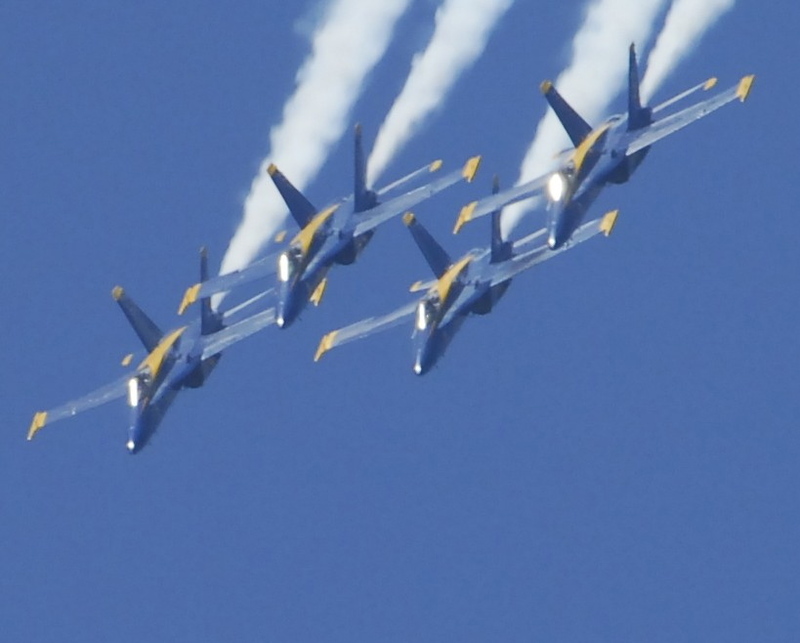 Folded footprint is 24 inches if the two halves are stored separately. If stored face to face, then it is about 28 inches. The steel apron/frame and undercarriage are industrial strength. All parts/tools were methodically numbered and a very good instruction manual was supplied. Assembly was a breeze and flipping the 2 halves was not a big hassle as they are independent. On par with a tournament grade table in terms of speed and bounce. My comparison is with the Joola SC3000 that our club has. Note that the black surface is not approved by ITTF, but it looks awesome and provides the maximum contrast against the ball, even in less than optimum lighting. Cannot fully speak to this as the table is brand new, and has not yet been abused as such. But it looks mighty durable, weighing at 245lbs. The 1" MDF surface doesn't look like it will warp or deteriorate in any way. The net that came with the table has elastic bands and is as lame as it gets, and needs to be tossed. I contacted Sportcraft customer service to complain about it, and apparently they sent me the wrong one. The replacement net (with strings) is arriving in mail any time now. The net post looks good, but is not metal. 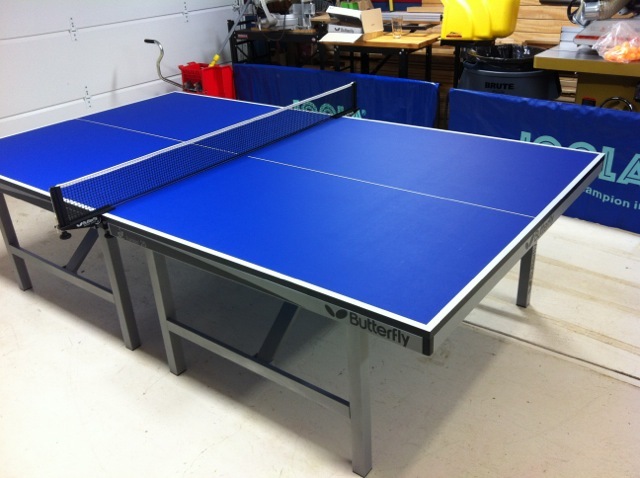 I also ordered a killerspin clip-on net set in red that will also match the look of the table nicely. Value for money, recommend or not? Here are some pics. Let me know if you need more specific details. It can be done by one person. You need to loosen the support brackets a little so they are not so taut and resisting the folding. Thanks for sharing the photos, that looks really compact and sturdy. I think I'll pick up one of these as soon as I get my current warped, dinged, and barely folding beater table out of there. Can anyone comment on the table? New to this forum and first post. I'm looking to get back into TT after no activity for 10+ years. I'm considering getting a ReturnBoard and a table for my basement for exercise/recreation. I could use some advise on the current state of tables. I had always been a big Stiga fan and our club had used Elite rollers(?) I believe. I had been thinking of the Stiga STS275 which I can get from Paddle Palace for $599. I wish it were a 1" top, but it appears to have a more heavy-duty frame than many of the other 3/4" tables. Seems to have a lousy net, though, so would have to add in a better one. Then I came across this forum and read through many of the postings. I'm now interested in what Joola has to offer, but I have one main concern. From many of the reviews at various places it seems the Joola tables suffer from a surface paint that comes off and leave marks. The Infinity appears to be a gorgeous table with a sturdy construction/top and very sleek design, but maybe why it's "affordable" is that the tables have this known problem. I also saw the Joola Inside table which can be purchased at Amazon for less than $400. It has a thinner top/frame, but the appears to have a nice net. However, does anyone know if the top on this model has similar paint issues? - blue-colored top! Much better for me to see the ball. - will not be rolled away much, so portability is not huge. 1) There was a small scratch on one table surface near the net. 2) The bolt sizes and quantities did not match the description in the paper instruction manual, or the S-25/S-22 manual which I downloaded from the website. (The online manual is somewhat better written than the included copy, but still lacking sufficient detail.) I am still not sure that I have enough, or the correct bolt sizes to fully assemble the table. 3) Most urgent, when we slid the first table half down the slots, and tried to connect the straight braces, the tabletop had to swing WELL past vertical in order for the holes in the straight braces to line up with the table angle bracket holes. This condition was so severe, that we cold not let go of the top, even with both braces connected, for fear of the tabletop falling over and/or breaking the frame or bolts. We tried multiple times, including loosening, disassembling the whole chassis, switching table top sides, to see if the holes would align better. The other tabletop half aligns much better, but is still somewhat past vertical when the straight braces are attached. I measured all of the critical dimensions that I could (straight braces hole distances, angle bracket distance to table center edge, etc). I did not find more than 2 mm difference in any of the lengths, and the chassis is not warped or crooked. As it is now, the table is impossible to assemble without a significant design modification. These issues, especially and critically #3, are most disheartening, considering I believed I was investing in a quality name brand of ping pong tables. What is more, I cannot determine a simple fix, for instance which part needs replacing. Needless to say, I am deeply disappointed. Anyway, have anyone here encounter such problem? We took the table to our basement and the thought of having to bring it back up to return is truly painful, as it is a heavy unit. Now I will read the reviews on this forum and try to research a bit more before purchasing a unit that can actually be assembled. Thanks for any help/thought you can share. The Expert Compact T1024 is made by Double Happiness (DHS). The table is made in China, and DHS is the number one selling brand in China. 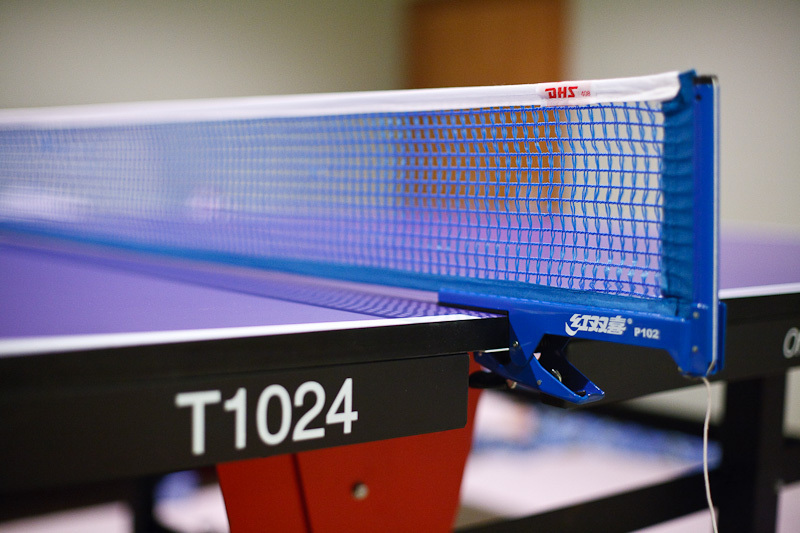 This table is ITTF approved! It has a 7/8" (22mm) top with a 2" by 1" steel support apron that runs around all four sides of each top piece. The surface of my table is matte blue. The bottom is panted similarly to the top, which is securely attached to the support structure with many steel brackets. This is has a rollaway centerfold design identical to the Butterfly Centerfold 25 and Joola 3000SC. It comes fully assembled in the box. The table is very study, durable, and heavy at 320 lbs. All four 4" casters include ball bearings, locks, and height adjustment with handy thumb screws. Like the rest of the table, the casters are substantial and made of durable rubber and steel. 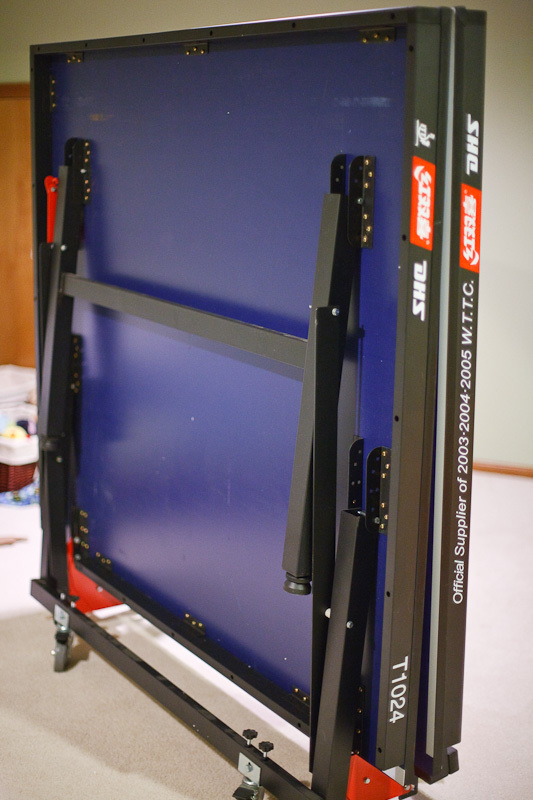 Additionally, each of the four corner legs has a height adjust mechanism. The table locks open at two corners. There is no plastic in the frame, except for the adjustable feet. This is an ITTF competition approved table. It has a very smooth surface with well defined lines. The play is fast and the bounce is even. I have only had the table for a few weeks, but considering the construction and quality materials, I doubt that warping or other durability issues will arise. Packaging was good, no table damage. AMAZING! The MSRP as of Jan 21, 2012 is $1499.00, but I got mine from Li-Ning for just under $475, including a P102 net. I picked the table up at the store to avoid shipping charges. The table is nearly identical to the Butterfly Centerfold25 and Joola 3000SC, but comes at a fraction of the cost even without the sale. The balls have left some dots upon impact (normal), but no paint rubs off onto the balls. For home use, playback position would occasionally be nice, especially with kids. This table does not have playback, but a number of other DHS tables do (Supreme Pro T1223, Rising Star T2125, and Eurostar T2023). The P102 net is everything you could want in a net. It clips to the net solidly and supports height and tension adjustment. The posts are metal, but there is an internal bayonet made of plastic that actually holds the net. The net came with some fibers that weren't perfectly horizontal, but I was able to straighten them with my finger. You'd be nuts to buy anything else. I looked for months before finally finding this table. The deal I got was an advertised sale by Li-Ning in Portland. If you're interested, you may want to give them a call. Note, I believe that Li Ning and DHS are somehow linked, like Li-Ning owned DHS. I am very happy with my purchase! 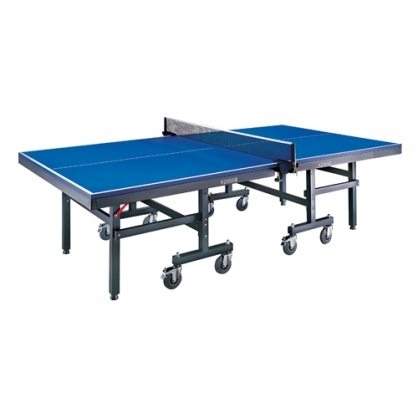 Hi TT experts, I'm looking to find a good quality, value priced table. Will have the table in the garage but like the idea of the durability of the outdoor table. In my research, I keep coming back to the Kettler Topstar XL. Seems like most of the outdoor tables have complaints about the bouce but this topstar model is supposed to have a certified bounce (whatever that means). Also I like how the net stays in place when it is folded up. I also have my heart set on a blue playing surface. I've seen several of these on Craigslist and they seem to get sold as soon as the ads get posted so it appears to be a very marketable model in case I ever wanted to dump it. Any thoughts on this model or one that would fit the bill for me? Thanks!! I'd look into the relabeled DHS tables that often go by "Giant Dragon" or "Sonic". You can get them shipped for $650 USD in the U.S. They're made in the same factory and identical (or very nearly so) to the Killerspin MYT10 tables that are retailed for $1300+. 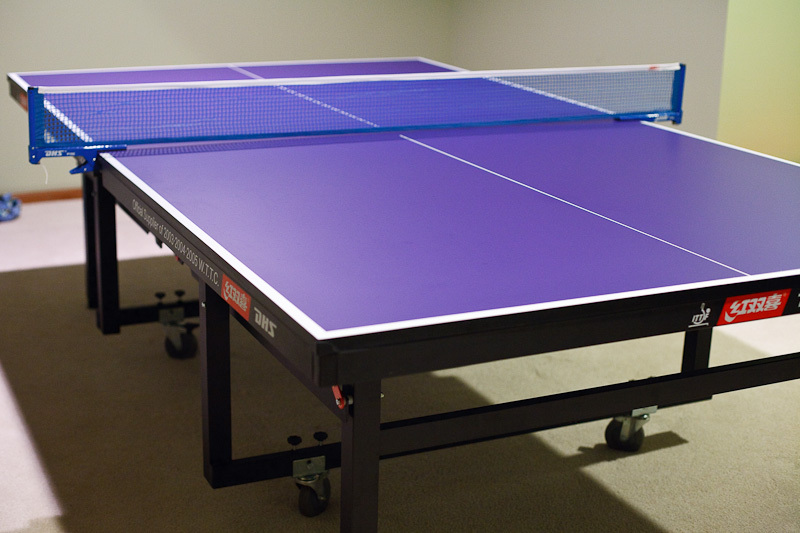 I got one in November for family as an early Christmas gift and it's outstanding: very heavy duty, blue tournament-grade wood surface, even bounce throughout, wonderful value. The net set they send with it is pure garbage, but you can get a very good DHS net set, like they use in international competitions, for less than $25 if you do some net searching. Anyone have any input on this table? Looks very good, incredibly good, for the price ($209). Just looking at the pictures and the weight (over 200lb), it looks to have the kind of construction you normally see on $600+ tables. This one from Walmart is the one I'd look at. Several folks have mentioned the Sportcraft Marquis. I'd like to know more about that AMF table as well. I was wondering about the differences, they look very similar, almost the same thing, though the Sportcraft somewhat heavier and the Sportcraft top 1" versus AMF 5/6". Both top thicknesses are very good, though, anything 3/"4 or over is fine by me. Both have laminate tops, so I know that's not as good, a little slower I'm told than the real wood, but a table tennis expert, entrepreneur, and coach--our own Cole Ely--recommended the Marquis to me months ago, I think they're used in a club where he's affiliated, so I know they're perfectly adequate. I was just wondering if the AMF was functionally equivalent to the Marquis. Looking to get one for my church, which might possibly start a little club in the future. Cole is who put me on to the Marquis. And now at Walmart it's only $259, delivered to the store. That is a heck of a deal for a 1" top, laminate or not. Lets keep this thread for reviews guys, and start a new thread on questions or advice about tables. We received the AMF table yesterday that I referenced above. It has a 1" top and actually appears to be the Sportcraft Marquis with different colors (instruction manual has a Sportcraft logo). So I'm almost mathematically certain it's the Marquis. It seems to be a solid table and has very similar quality framework to my DHS table that cost about $700 (that's virtually identical, and may be for all intents identical, to the $1200-$1300 Donic Persson, 25, also evidently made by DHS). In other words, but for a laminate surface, this $208 AMF is built almost like a $1,000 +/- table. Only knock is the metal apron, which is thin aluminum angle iron and appears primarily cosmetic rather than something that actually supports the surface and prevents warping. But I'm sure I could pick up about 25' of square 2" metal tubing, paint it gloss black, and screw it into the bottom of the MDF top and take care of that for less than $100. The table appears nearly identical to the $1300 Donic Persson 25 and the $2000 Butterfly Octet 25. Not a copy or knock off, it actually appears that at the DHS factory they just painted some up in Donic regalia, some Butterfly, some off brand "Sonic" like mine, perhaps put a bracket in a slightly different location, and sent them out--the same tables--to different companies with vastly different prices. My Sonic is actually heavier than the Octet 25 by a dozen pounds or so and 2 lbs lighter than the Donic. The Sonic 400 has held up well to the rigors of 8 children. The surface is impeccable, we've dropped things and smacked rackets on it, but virtually all marks are temporary and can be easily rubbed out. Worst that's happened is a few tiny (1/8" or so) paint chips coming off where the white border is painted and we inadvertently slammed a racket onto it. I could spend 5 minutes with white touch-up paint and it'd be fine. The surface is 25mm and like a rock, bounce great. I play sometimes on a Stiga Expert Roller locally, and that $1100 table doesn't have as nice a bounce, in my opinion, as the Sonic 400. I did have to buy a DHS net set because the one supplied with the table was awful. Picture from Wal-Mart website below, will be glad to take and post picture of my own from my game room if someone wants me to, but the Wal-Mart picture is accurate. Does this have levelers on the legs? I thought it was a 5/6" top, not 1"
Hard to believe, but I don't even know, I just dumped the thing off a the TT club/church bldg with my friend and we agreed to get together Saturday to finish putting together. I'll let you know then. That's the funny thing, so did I. But when I got it in, it looked to be exactly the same thickness as my DHS 1" top at home, so I measured it and lo and behold, not .83", but 1.0" on the dot! I have no idea why they'd underestimate in their marketing. The thing really does look to be solid, I can tell you how it plays on Saturday. I am pretty sure Cole Ely has the same setup, just in Sportcraft livery, at the club he attends and teaches at in Kansas, and he says it's fine, a good table. I'll keep you updated. I'm actually afraid to mention the price... it was soooo low. What I can tell you is that Dan Robbins is one class act. I'm very glad I gave him my business. And I will do so again. Looks beautiful, Cameron. But why so coy about the price? Just put the AMF Platinum (Sportcraft Marquis with different colors) together a couple hours ago and played a bit on it. Yes, it has levelers on the legs. They're not the super heavy duty kind as on my DHS table, but they're fine. The table plays reasonably well. I'm not enamored of the surface, it's a bit slow, but not bad really. Playable. I actually like it better than the Stiga Expert Roller I sometimes play on, but not as well the play on my personal table at home, a 1" DHS surface. All-in-all, though, the AMF's a decent table, reasonably heavy duty, quite a price. If our church-based club takes off, I wouldn't hesitate to buy a couple more of the AMFs. The only knock as I said is the lack of a real apron (which I intend to fix as soon as I can find some 2" square metal tubing cheaply) and the crummy net set, which I replaced with a Killerspin Aurora. I just got my AMF 5000/Sportcraft Fury table shipped today and after opening the box, I was horrified to realize that the large box containing the table components had a huge hole in it, and inside was a poorly taped and half-opened "parts tray" with the screws and bolts spilled out into the bigger box. The worst part came when I counted all the screws, nuts, bolts, etc. and discovered that I was missing a few parts. No matter, I could always call up Sportcraft to send some replacements as they had mentioned in the manual! Or so I thought. Their phone number doesn't work anymore, website is down, nothing. Seems like they went out of business and I'm out of luck. I'm going to call up Walmart tomorrow morning and get replacements from them. Otherwise, I'll have to return the table to them and demand a full refund. Beware of buying anything Sportcraft. They filed for bankruptcy at the end of 2011 and planned to liquidate all of their products (hence the extremely low prices). At this point, if anything happens to your product, there's no one to fix it for you. Remember, you pretty much always get what you pay for. 1' thick table for only $250? Definitely going to have some major drawbacks. I learned my lesson. 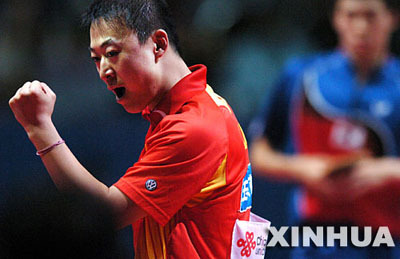 There are many good tables around (ITTF approved and non-ITTF), it all depends your requirement and budget. If you can afford, get the best (those used in International competition), and customize it. Wow, that's why the crazy low prices on that Fury table. Well, the AMF Platinum/Sportcraft Marquis I got was damaged somewhat, apron bent and scratched, frame a little bent, some screws pulled out of the bottom of the playing surface, looked like they'd shoved one that had been banged around by a forklift into a pristine box and sent it out the door. The kind of fraud and/or poor quality control that goes on sometimes when a company starts going south. Fortunately the surface was fine, no cracks and my wheeler dealer friend who helped me pick the thing up managed to negotiate a deal with a Wal-Mart manager on the spot to get the thing for $100 (rather than $208) out the door. I'm actually somewhat handy and have power tools about. The friend and I managed to get everything fixed up and put back into its proper place within 3 hours. Now the table, but for a bit of cosmetic stuff that's not all that noticeable, is good as new. It ended up being a great deal. Also, you ought to be able to get whatever you need from Lowes, Home Depot, etc. for maybe $10. Really no problem, just take in the assembly instructions with the pictures of the components, they'd probably get you set up in 15 minutes. I wouldn't throw such a good deal back in their faces on that account alone. So long as the surface is in good condition (if not, that's a deal-breaker), I'd say you've got a very nice product that's salvageable. Even bent framework, so long as not kinked, can be repaired with a little ingenuity. Same here, there was some heavy duty handling with my package. Numerous dirty footprints on the huge box the table came in, and a few gaping holes. But that just seems like mishandling on the part of the shipping company. My bigger concern is that the table they sent me seemed like it was a return from someone else. The poorly taped up part tray, the fact that a few of the washers were already attached, the scratches and chipped paint, etc indicated that a past customer wasn't satisfied with what he bought (like myself at this point haha) and returned it. And it seemed like the seller hurriedly repackaged it and sold it back to the next person, which was unfortunately me. I personally don't mind much the cosmetic stuff either, but when you have missing parts, it's a little more troubling. It's not a big problem at this point, because I've counted all the parts again and will be able to get the missing ones at the store. At this point, returning it would be a bigger loss--I probably would have to pay half the shipping, which comes to a little more than $50. I'm going to finish the table tonight hopefully. Thanks for your help! Also, I absolutely see no point in the frame attached to the edge of the table. For the high-end tables, this frame usually serves to stabilize the top. But in this case, it seems like the flimsiest part of the table, and frankly, it seems to be there more for looks than anything. Do you think there's any harm if I just unscrew the whole thing off? The table is pretty heavy, and the frame just makes it harder to lift up.